Gilbert, Arizona – The Arizona Legislative District 12 Republican Party, representing Gilbert and Queen Creek, expresses its deepest gratitude and appreciation for the career of principled public service Congressman Matt Salmon has given to the people of Arizona. While it is sad to lose a conservative warrior, like Salmon, in the U.S. House of Representatives, we are confident that Senate President Andy Biggs will immediately take up the fight to restore fiscal sanity in Washington, protect our borders and advocate for the heroes serving in our armed forces for Arizona’s fifth congressional district. PHOENIX (February 25) – Arizona Senate President Andy Biggs today announced he will run for Arizona’s 5th Congressional District. Biggs, a 25-year Gilbert resident, made the announcement following U.S. Representative Matt Salmon’s announcement earlier today that he is retiring from the office. Pledging to be a passionate advocate for the heroes who made enormous sacrifices while serving our nation proudly, as well as the men and women who wear a uniform today and defend our homeland. “I am excited and grateful to kick-off my campaign with Matt as my Chairman. 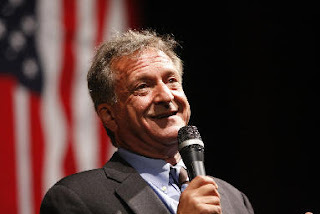 As a co-founder of the House Freedom Caucus, he is a true champion for the conservative movement and has served his constituents with the highest esteem,” Biggs continued. “His leadership will be sorely missed, and I am honored to have his full support for my campaign. (Phoenix, AZ) — MBQF, a public affairs consulting firm, announced the results of a recent survey concerning top tier GOP candidates for president of the United States of America. The results from the survey show high efficacy primary Republican voters across Arizona represented by likely 2016 turnout models. In the most recent automated telephonic survey of 736 high efficacy primary republican voters, conducted on February 22, 2016, the survey calculates a 3.61% theoretical margin of error, plus or minus in percentage points, 95% of the time. 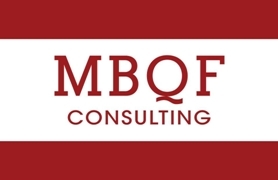 For more information about this survey, or a summary of topline data and wording, please contact MBQF Consulting. The margin of error for this survey is +/-3.61%. Over 40,000 children visited the once top rated Arizona Mining and Mineral Museum in Phoenix every year. Most were brought by teachers or scout leaders to participate in structured earth science education programs. School busses arrived almost daily, and came from as far away as Yuma. Conservative comedian Evan Sayet is proving that conservatives can be successful in entertainment. Somehow he figured it out despite intense opposition toward conservatives in Hollywood. Last year, Evan Sayet started a national tour of his long running comedy show, The Right to Laugh, which did so well he’s now embarking on a return tour. I attended his show last year when he came to Scottsdale, Arizona, and have never laughed so hard. Dennis Prager calls him “The funniest man in America.” Warning: I do not recommend bringing a progressive to his show if they don’t have a really good sense of humor. Evan’s style is sort of a cleaner version of Dennis Miller. What I personally enjoy about Evan is he is a true star, but he is also classy and nice. Can’t say that about many of the progressives in Hollywood. There are a good many reasons, but first and foremost amongst them is that people in the entertainment industry make so much money at such an incredibly early age that they are totally isolated from reality. The majority of conservatives in America only became conservative once they entered the real world and tested the theories of their childhood against reality. The entertainer, if you’ve heard his name, has never had to enter the real world and thus he never grows up to become a conservative. 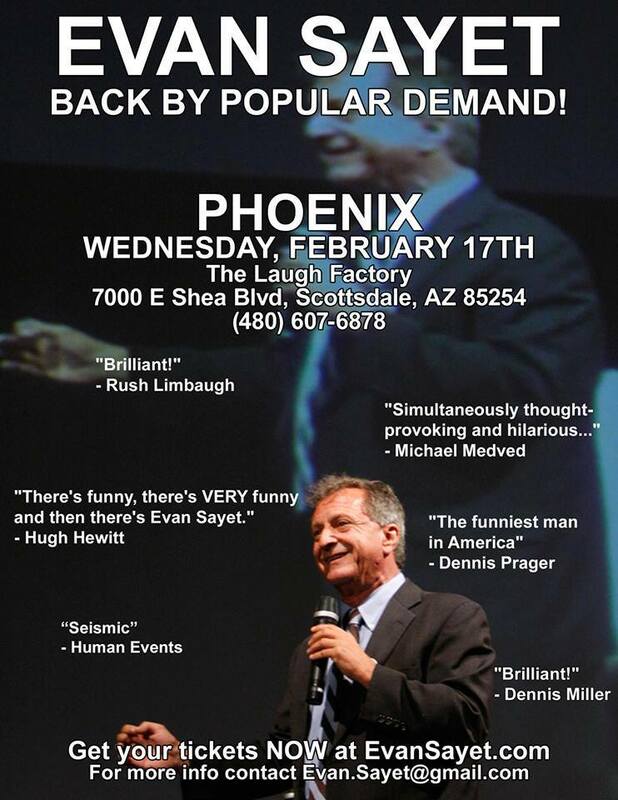 If you missed conservative comedian Evan Sayet last year when he was in town, you can catch him this Wednesday in Scottsdale. I went last year and had a blast, he insults the left nonstop, reminds me a little of Dennis Miller. Click here to buy tickets, only $20 (there may be a two drink minimum but you can buy pop). Please spread the word, conservative comedians are shunned by the mainstream media so he relies on us conservative activists to get the word out. We’ve gotta support our conservative entertainers! I interviewed him last year here. PHOENIX – This afternoon Chairman Robert Graham of the Arizona Republican Party expressed outrage today at the ongoing efforts by a former local Republican party leader, A. J. 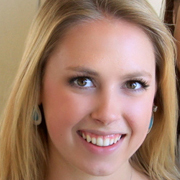 La Faro, who is trying to prevent thousands of Republican Precinct Committeemen from voting in upcoming party elections. Republican Precinct Committeemen (PCs) are elected by Republican voters in each of Arizona’s nearly 1,500 voting precincts statewide. PCs gather each month to conduct party business, and state law permits them to vote by proxy if unable to attend a particular meeting. PCs can provide a signed, witnessed (or notarized) proxy form to a trusted Republican from their precinct who is attending the meeting, and who may cast their vote for them. The practice assures each and every PC can vote on party business, even if unable to physically attend the meeting. In typical party meetings about half the votes are cast by proxy. At the recent meeting of Maricopa County Republican PC’s chaired by Tyler Bowyer, for example, there were 1,006 present at the meeting and an additional 989 who voted by a proxy given to another member. With significant meetings in the coming months being called throughout Arizona to elect delegates to the Republican State Convention, the right to vote by proxy is especially important. The Republican Party State Convention, to be held on April 30, 2016 at the Mesa Convention Center, is where the state delegates elected by the PCs assemble to elect 55 delegates to be sent to the Republican National Convention in Cleveland in July, where the Republican Nominee for President is selected. Does Your State Want to Replace Electoral College With Popular Vote for President? An 11th state looks ready to join a national movement to sideline the Electoral College and decide presidential elections by popular vote. A bipartisan bill moving through the Arizona legislature aims to reallocate the state’s 11 electoral votes to the presidential candidate who wins the majority of votes on a national scale rather than the candidate who wins the state. The legislation is part of a nationwide push called the National Popular Vote plan, an effort to create an agreement among states that vow to automatically elect the president of the United States using the national popular vote instead of the final vote count in each respective state. Robert Hathorne, a Republican activist residing in Arizona, warns that the initiative would “fundamentally change America” by shifting the national political system from a representative democracy to a pure democracy. “Majority rules was the greatest fear of our Founding Fathers; this is why ‘democracy’ is not written one time in the 4,543 words of the Constitution,” Hathorne told The Daily Signal. The framers of the Constitution established the Electoral College to give smaller states a voice against larger states when selecting the nation’s leader. Electoral votes are delegated based on a state’s population. Rhode Island, for example, has four electoral votes, while California has 55. A presidential candidate currently needs a majority of 270 of the Electoral College’s 538 votes to win the White House. Hans von Spakovsky, a senior legal fellow at The Heritage Foundation, said the National Popular Vote initiative seeks to breach the Constitution and likely would end up in the U.S. Supreme Court. “This entirely changes how the president is elected, and therefore, it affects the basic structure of the Electoral College and the Constitution,” von Spakovsky told The Daily Signal. Advocates are working to secure support from enough states to reach 270 guaranteed electoral votes, which effectively would throw the outcome of presidential races into the hands of the popular vote. So far, 10 heavily Democratic states—California, Hawaii, Illinois, New Jersey, New York, Maryland, Massachusetts, Rhode Island, Vermont, and Washington—have joined the District of Columbia in signing such legislation into law. Those states make up 165 electoral votes, meaning the initiative has reached roughly 60 percent of the 270 votes needed to reach its goal of sidelining the Electoral College. Arizona would make it 176. The pact won’t go into effect until enough states sign on to hit 270 votes. Instead of amending the Constitution to eliminate the Electoral College, popular vote advocates are working around the challenging ratification process by going through the states. Doing away with the Electoral College completely requires a constitutional amendment, meaning two-thirds of both the House and Senate would have to vote for repeal, and then another three-fourths of the states would have to ratify the new amendment. The National Popular Vote initiative instead works on the state level through an interstate compact requiring far fewer states to support the new process and reach 270 electoral votes. In fact, that number could have been as low as 11 states. Heritage’s von Spakovsky notes that the Supreme Court clarified this provision in the case Virginia v. Tennessee, ruling that only those interstate agreements that increase state power while diminishing federal power must be submitted for congressional approval. If the National Popular Vote effort reaches its goal of 270 electoral votes, von Spakovsky predicts, the states that decided not to join the pact immediately will file a lawsuit and ultimately land the case in the Supreme Court. Opponents of national elections by popular vote, including von Spakovsky and Hathorne, argue that the change would create incentives to commit voter fraud in single-party states and jurisdictions. In deep-blue New York, for example, the incentive for voter fraud isn’t high, because residents know the state is going to elect a Democrat regardless. But if you move from a state-by-state voting system to a national one, von Spakovsky warns, the incentive to “stuff” voting boxes rises: Not only would a Democrat win New York, but he or she could win the national election. “Why should as few as 12 to 15 states that make up 270 electoral votes rule over 35 other states?” Hathorne asked. Proponents such as those working for FairVote, for example, argue that the Electoral College creates a “winner takes all” system that drives disparity between “swing” states, where candidates actively campaign, and “solid” states, which the organization says are largely ignored. Advocates of a popular vote say the change would make every state significant during the election process. Today, it’s possible for candidates to secure the White House without winning the popular vote across the nation. In 2000, George W. Bush won the presidency after the Supreme Court determined he had won Florida even though Al Gore, his Democratic opponent, won the majority of votes nationally. Bush edged Gore by five electoral votes. The National Popular Vote movement sprung up in the mid-2000s following Gore’s contentious defeat. Through it, a candidate could win a plurality of the national vote and clinch the big seat. If electing a president is based entirely on who wins the national popular vote, if that were the 2000 situation, it would have forced a recount in the entire country because every single vote could’ve made a major difference. In Arizona, the legislation enjoys broad support from both parties in both the House and Senate. But von Spakovsky says voters actually will lose influence if the state switches to the popular vote idea. He said paid lobbyists, backed by enormous amounts of money, are feeding state legislators “false information” to advance the movement. “The legislators who have signed on this are being fooled and are being foolish in voting for it,” von Spakovsky said. VIDEO: What is Arizona’s Prop 123? The first video by supporters of Prop 123 has debuted. Watch as parents and teachers explain what Prop 123 is and why they are supporting it on May 17th.